Our local glazing services for glass repair and replacement windows can be contacted via our freefone number 0800 046 2633 or alternatively please use the form provided below. Our dedicated team of local glazing experts will do our best to get back to you in as little time as possible. 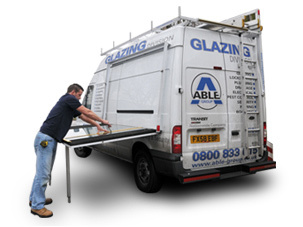 Able-Glaze treats all there customers with care and with the up most respect. Laminate Glass is used where glass integrity matters. Laminate glass is two thin sheets of glass, bonded together with a pvu interlayer. The interlayer spreads the force of the impact across a wide area, creating the distincting "Spider-Web" apprearance. Laminate glass can also be used in double-glazing installations. Laminate glass comes in three major sizes, namely 6.4mm, 8.8mm and 10.8mm. Customer Name: Mrs M Clark. Please can you let your engineer (Rob) know how happy and impressed I was with his work.